James Carpenter Design Associates, as part of the Michael Van Valkenburgh Associates (MVVA) team that won the 2010 City+Arch+River international design competition, is seeing its substantial plan for the Museum at the Gateway Arch come to life. 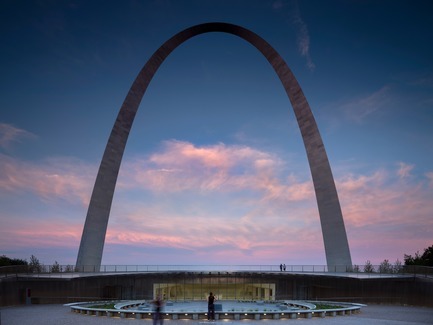 Cooper Robertson and James Carpenter Design Associates (JCDA) with Trivers Associates have designed the significant expansion and renovation to the Eero Saarinen-designed Museum of Westward Expansion, located directly below the iconic Gateway Arch. The Museum developments are one part of MVVA’s comprehensive renewal of the National Park’s Dan Kiley-designed 91-acre landscape with dramatically improved connections to downtown St. Louis. 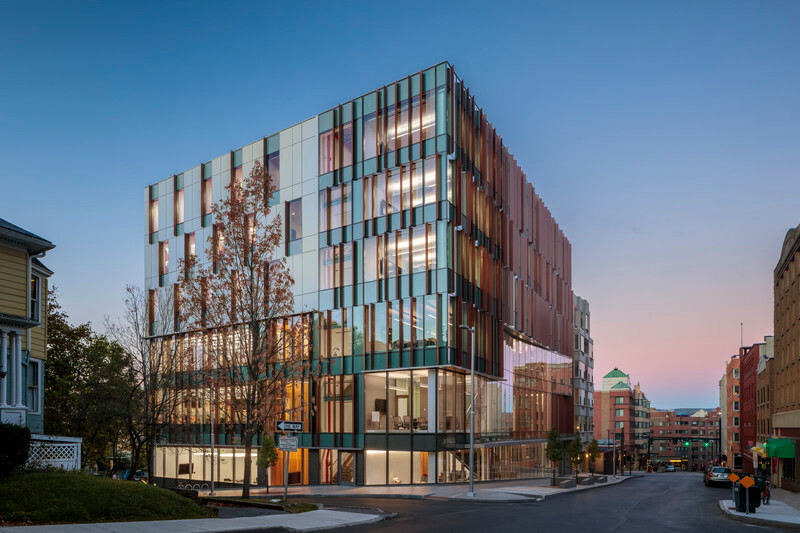 Within this comprehensive project, the work of James Carpenter Design Associates (JCDA) has focused on leading the planning and design of the Museum’s new West Entry and public spaces. 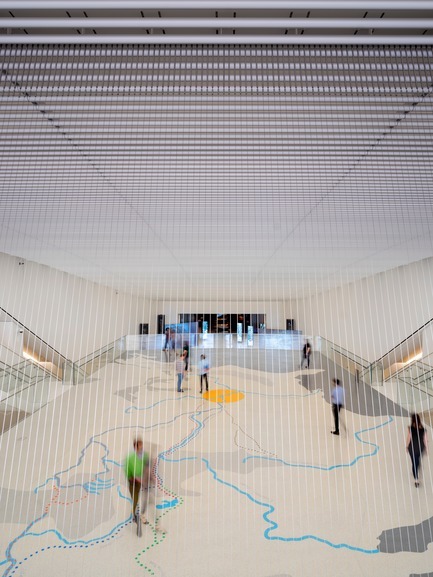 JCDA has applied its design approach to the entry sequence and the new main public spaces of the Museum Arrivals Hall, which lead down to and connect with renewed exhibitions and the renovated Saarinen museum below the Arch. 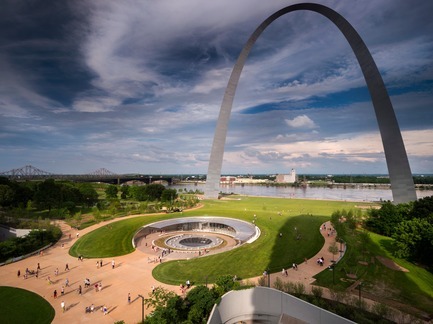 Beyond transforming, modernizing, and improving the Museum, the explicit project goal was to better integrate the new and original Museum with the National Park Service’s Gateway Arch landscape and improve connectivity between the Park, the Old Courthouse, and downtown St. Louis. 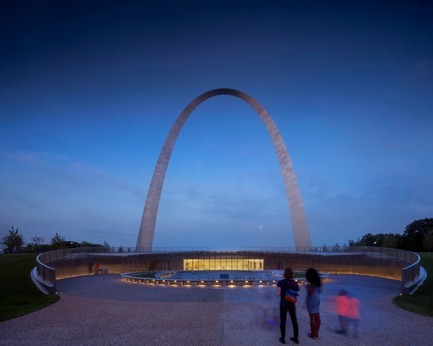 JCDA and Cooper Robertson have created a new civic space that engages with and re-enforces the presence of the international icon of the Arch, while directly supporting a connection and reciprocity to downtown St. Louis. 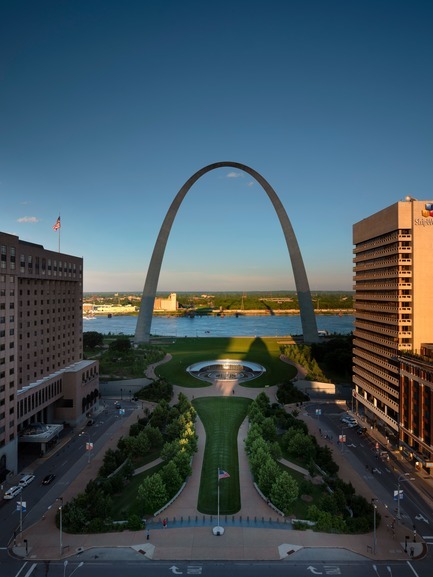 This crucial connectivity between the city, the park, and the Mississippi River embankment has been absent since the Gateway Arch was first proposed, primarily due to the presence of Interstate 44, a six-lane-wide highway trench in the landscape. Because of this, a significant piece of MVVA’s new work creates a landscaped park over the highway that now links a sequence of green spaces into a unified thread connecting from West to East: Washington Square Park, Poelker Park, Serra Sculpture Park, Citygarden, Kiener Plaza, the now restored Old Courthouse (site of the Dred Scott Case), Luther Ely Smith Park, and the now-accessible Gateway Arch and the banks of the Mississippi, creating a seamless pedestrian experience. 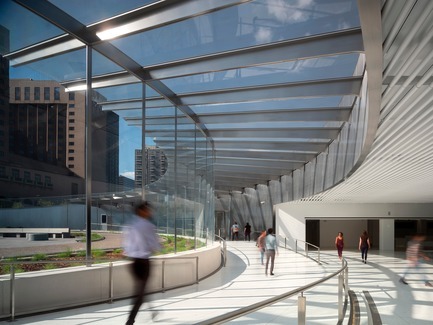 The semi-circular, enclosed glass entry volume mediates the transition into the below-ground Museum Arrivals Hall, modulating brightness from outside to inside. As visitors enter, the luminous ceiling leads the eye down to the point of transition into the Saarinen Hall, by following exactly the slope of the natural landscape. This clarity of circulation is maintained through the West Entry and Museum Arrivals Hall, where at the moment of entry, visitors can see down to the intermediate level mezzanine: an educational interpretive space enlivened by a large scale floor map of the Mississippi River and its tributaries. Looking further down into the new expansion, visitors see the beginning of the new exhibitions leading into the restored Saarinen Hall and the lifts that take the visitor to the top of the Arch. The main escalator circulation is carved into both side walls of the new West Entry, flanked by open stairs connecting to the mezzanine and lower level. 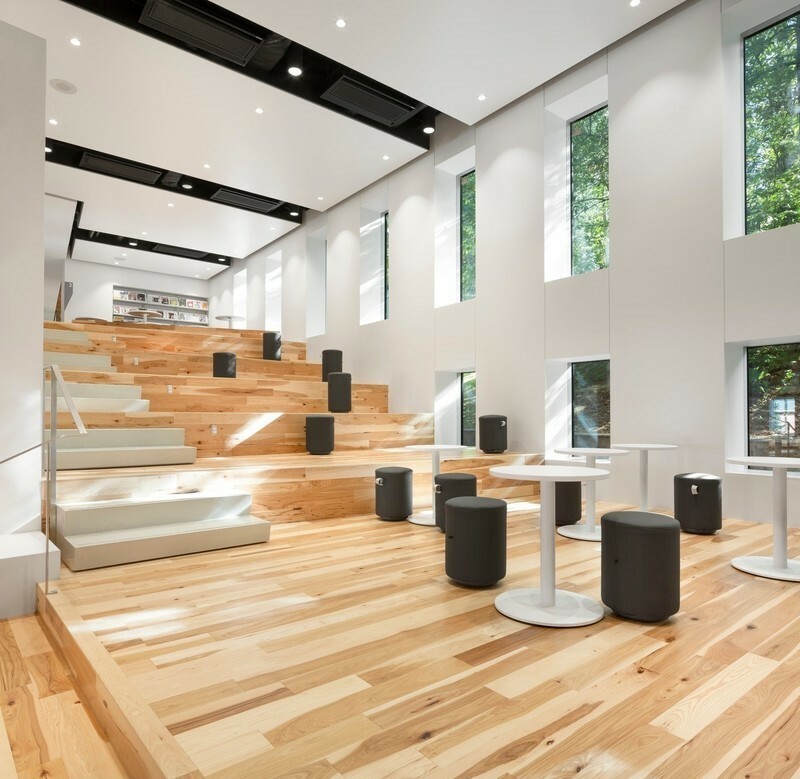 Beneath the mezzanine is an open glass education space for school groups or special functions. From the exterior, the main axis of the entry is emphasized by its minimal structure, which allows views down into the Museum while behind sits the Old Courthouse, establishing an intimate visual link between the two landmarks as well as a dialogue between old and new, and an expansive civic space between the two that has until now been absent from the site. The materiality of the new West Entry Plaza of the Museum embraces the visitor in an arc of sky and the surrounding landscape, reflected by the diffused scrim of stainless steel screen walls. The tilt of this reflection references the Arch itself, intuitively leading visitors from the Plaza exterior into the Museum’s glassed-in entry volumes. Stainless steel railings lead visitors up above the entry to create a Westward outlook, framing the Old Courthouse with this reflection in the glass canopy below. Integrated lighting maintains the screen and railing function day or night. 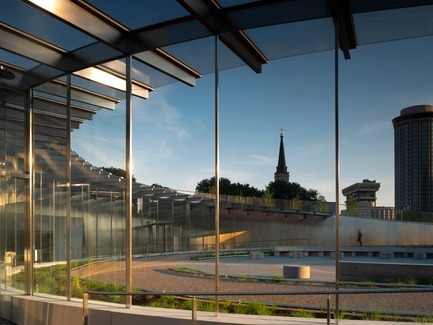 Within the Entry Plaza, strategic landscaping merges views into and out of the Museum with landscaping in the larger environment, connecting the park and the Museum. 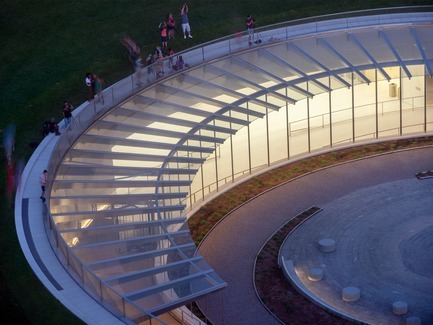 The entry’s glass canopy is pitched downward slightly, just enough to make visible the sky incised into the park landscape as visitors approach and enter the Museum Plaza. 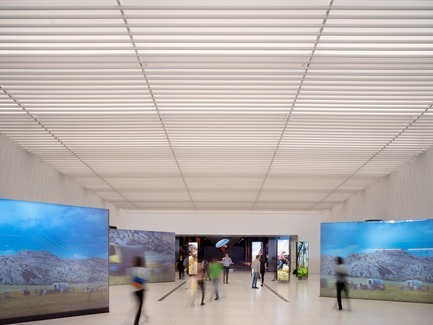 The enclosed glass entry volume and the new West Entry ceiling assembly also function to mediate the passage into the Museum, modulating the brightness as visitors transition into the below-ground galleries. Within the new entry, the expanded path to the Saarinen Hall is emphasized in the wide side walls, each enclosing an escalator and creating a volume that feels as though it is carved out of the existing landscape. The park overhead is supported by the roof beams of the West Entry and Arrivals Hall, the depth of which are veiled by a unique ceiling assembly consisting of a screen of custom tubular extrusions, hung below the beams. 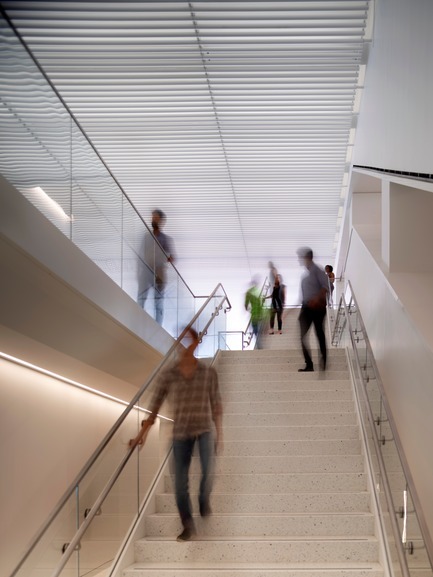 Light is directed upwards into the volume between each of these, onto a ceiling featuring a diffuse optical aluminum panel which, indirectly visible behind the field of tubular extrusions, creates a sense of depth that appears to extend beyond the building’s physical ceiling plane. The defining component of the arrival experience to the Museum is the integrated circulation for all visitors through the new West Entry. As visitors traverse the new landscape bridge over I-44 and approach the Museum, two paths graciously converge and lightly descend to the entry. The design team worked closely on this approach, to develop longer paths that arc around a reflecting fountain and parallel the inclined entry wall. The additional length allows the paths to be completely accessible, and the gradual slope in turn creates a gentle descent and transition from the landscape to the museum entry. 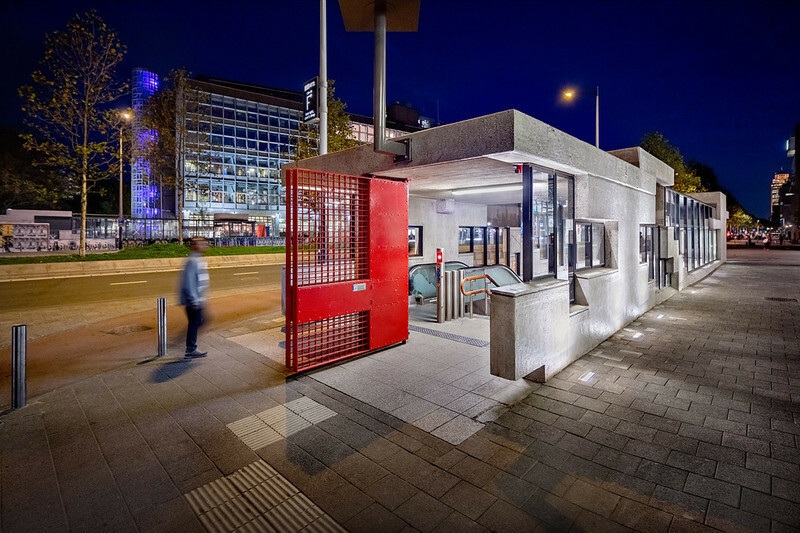 The off-axis approach ensures all visitors travel along the same route and have the same arrival experience at ticketing: a framed view of the Courthouse to the West. 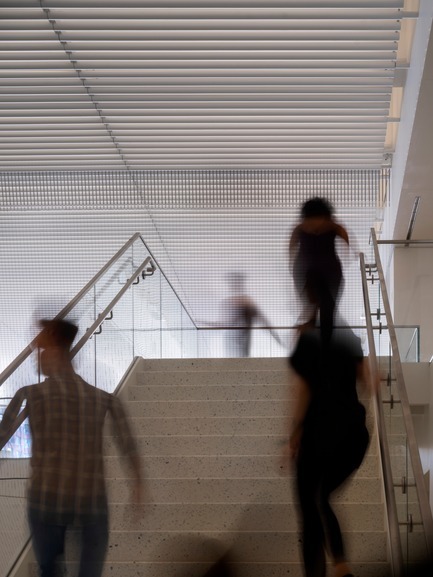 The principles of shared circulation paths extend down into the Arrivals Hall, completing a 30’ descent down to the existing Museum entry level. An important part of the design criteria for the new West Entry was ensuring it could withstand a specified blast event. 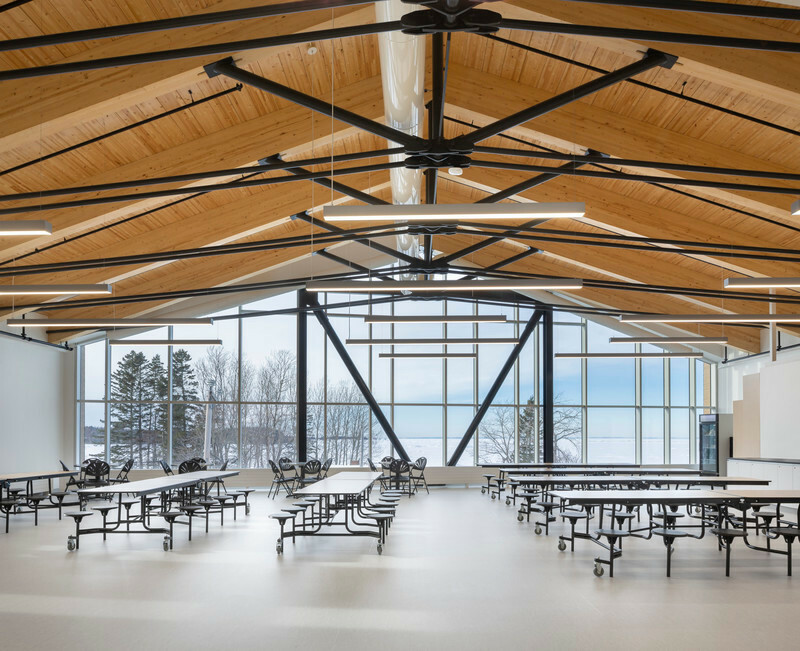 Given the need for a light and open new entry to the Museum, the team opted to use a balanced tensile structure to absorb the stipulated forces. This structural system used less material while efficiently addressing absorption of an energy event: more like a tennis ball hitting a net and less like the same ball bouncing off a brick wall. The system is comprised of a series of solid stainless steel canopy ribs cantilevered off-cast-concrete walls, concealed in the landscape side of the entry; the ends of each rib pulled down with milled stainless steel tension elements and secured in a concrete grade beam below the entry finishes. This pull down force is balanced to ensure that snow, maintenance, and other anticipated loads do not exceed the tensile amount in each element. 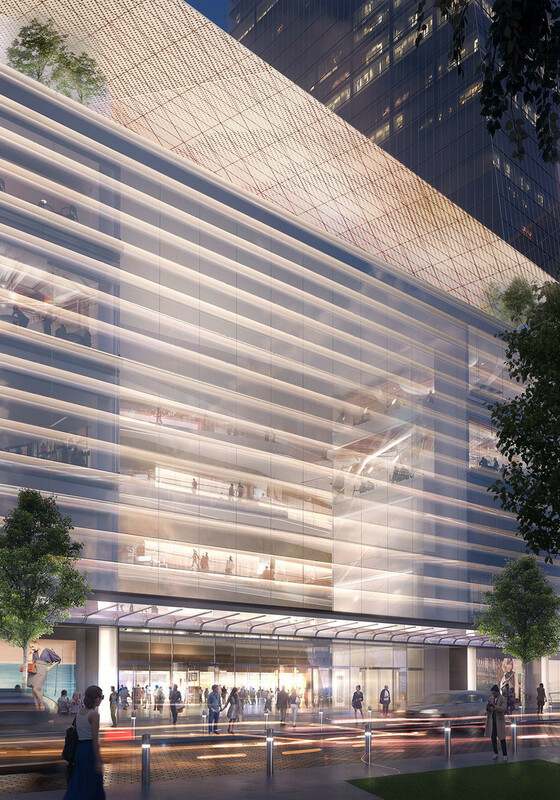 The rectangular elements arc around the West portion of the entry with a minimal presence, while maximizing visibility to the reflecting water feature and the Courthouse. 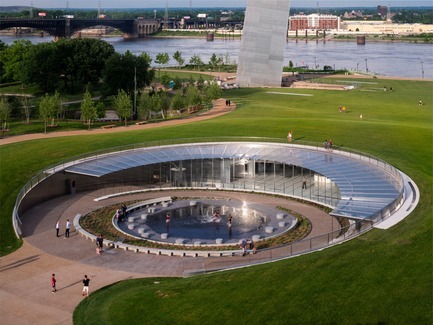 Beyond expanding and modernizing the Museum at the Gateway Arch, JCDA has created a civic space that engages with the iconic presence of the monument itself, while directly supporting a new connection to and reciprocity with downtown St. Louis. 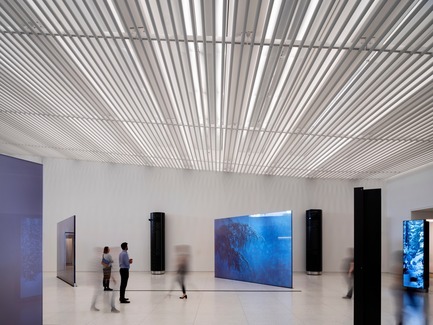 With sensitive planning, innovative materiality, and refined details, every aspect of the Museum’s expansion is now animated by a meaningful vocabulary of light, as is typical of the JCDA approach. On a smaller scale, the design’s sensitivity to light and landscape results in an accessible, intuitive visitor experience from the Park, the Courthouse, and from downtown St. Louis. In a sense, the resulting landscape brings to fruition what the site was intended to be when the Arch was first proposed. The entry sequence and public space design led by JCDA has opened up the site for public agency, made evident by the fact that citizens have begun to use the new civic space even prior to the opening date. The seamless path from this space to the pre-existing, Saarinen-designed museum results from an attention to the existing landscape, which is now connected to the river and thread of green space that extends from West to East in the city: for the first time not interrupted by the highway. 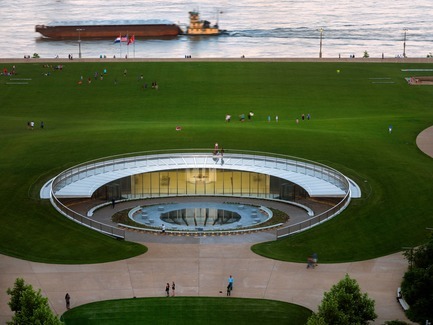 The Museum’s new sense of space and generosity that results from this responds to and references the revitalized landscape of the Arch grounds, as well as its significant new engagement with the city, river, and region. well-supported resource to the community and nation for generations to come. Founded in 2009 to support and coordinate a project to connect, invigorate and expand the Arch grounds, the Foundation is now a conservancy that will collaborate with partners to operate and maintain the improvements made through the CityArchRiver project, which is scheduled to be completed July 2018. The crucial connectivity between the city, the park, and the Mississippi River embankment has been established by bridging Interstate 44, a six lane wide highway trench in the landscape. The materiality of the new West Entry Plaza of the Museum embraces the visitor in an arc of sky and the surrounding landscape, reflected by the diffused scrim of stainless steel screen walls. The tilt of this reflection references the Arch itself, intuitively leading visitors from the Plaza exterior into the Museum’s glassed-in entry volumes. 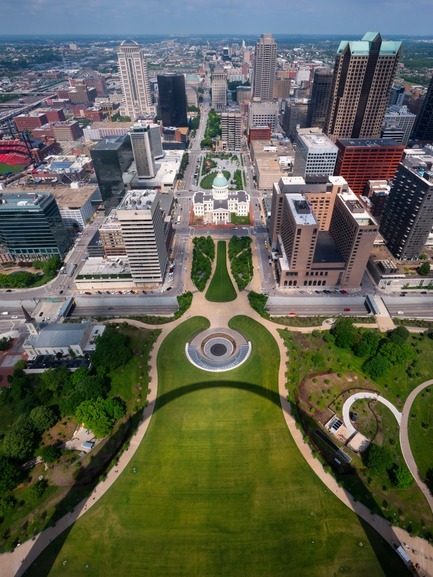 Beyond transforming, modernizing, and improving the Museum, the explicit project goal was to better integrate the new and original Museum with the National Park Service’s Gateway Arch landscape and improve connectivity between the Park, the Old Courthouse, and downtown St. Louis. 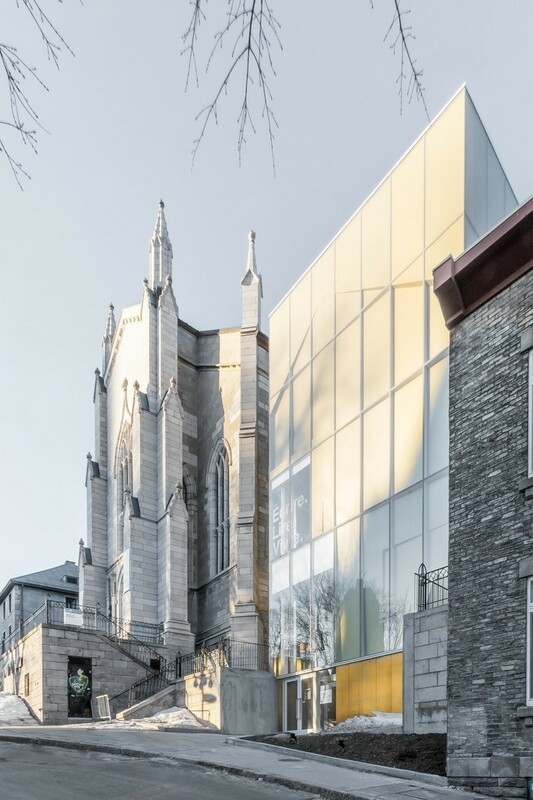 Within this comprehensive project, the work of James Carpenter Design Associates (JCDA) has focused on leading the planning and design of the Museum’s new West Entry and public spaces. JCDA has applied its design approach to the entry sequence and the new main public spaces of the Museum Arrivals Hall, which lead down to and connect with renewed exhibitions and the renovated Saarinen museum below the Arch. 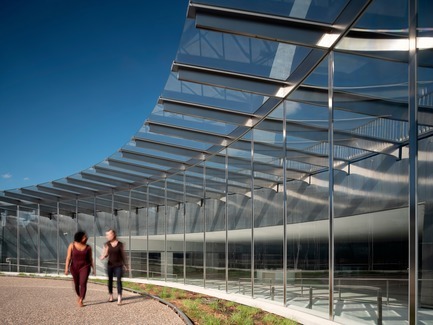 The semi-circular, enclosed glass entry volume mediates the transition into the below-ground Museum Arrivals Hall, modulating brightness from outside to inside. The enclosed glass entry volume leads visitors on a gentle slope into the museum. Inside and out, the main axis of the entry is emphasized by its minimal structure, establishing an intimate visual link between the museum and the Old Courthouse. The materiality of the new West Entry Plaza of the Museum embraces the visitor in an arc of sky and the surrounding landscape, reflected by the diffused scrim of stainless steel screen walls. This clarity of circulation is maintained through the West Entry and Museum Arrivals Hall, where at the moment of entry, visitors can see down to the intermediate level mezzanine: an educational interpretive space enlivened by a large scale floor map of the Mississippi River and its tributaries. Looking further down into the new expansion, visitors see the beginning of the new exhibitions leading into the restored Saarinen Hall and the lifts that take the visitor to the top of the Arch. The below ground transition to the Saarinen Hall is unified by the luminous ceiling. The main escalator circulation is carved into both side walls of the new West Entry, flanked by open stairs connecting to the mezzanine and lower level. A combination of large planning moves and refined details emphasize a sense of light and sky throughout the museum circulation experience. View from the Old Courthouse at dusk. Stainless steel railings lead visitors up above the entry to create a Westward outlook. 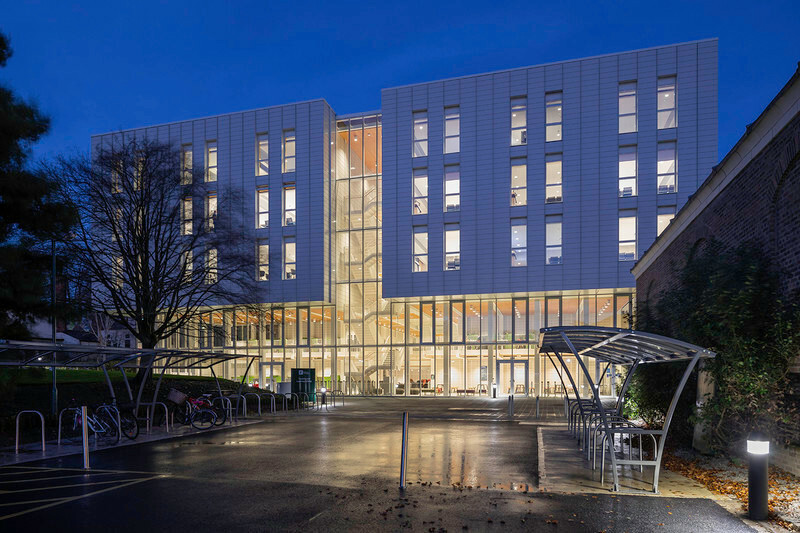 Integrated lighting maintains the screen and railing function day or night. 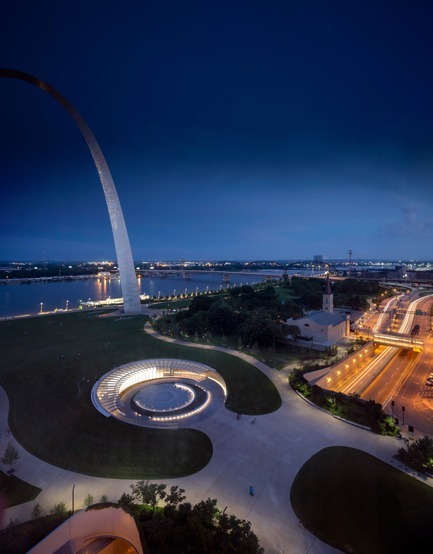 Day and night, the design’s sensitivity to light and landscape results in an intuitive, accessible visitor experience from the Park, the Courthouse, and from downtown St. Louis. 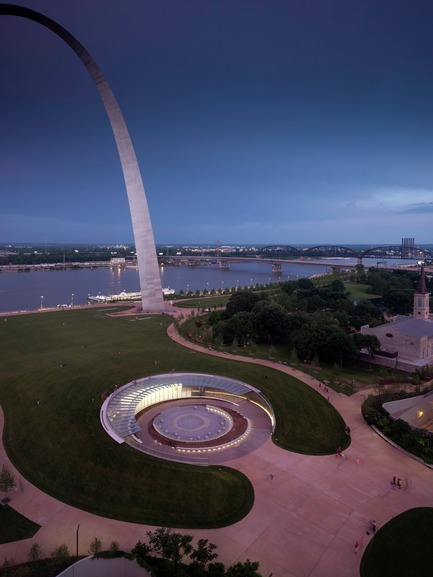 Beyond expanding and modernizing the Museum at the Gateway Arch, JCDA has created a civic space that engages with the iconic presence of the monument itself, while directly supporting a new connection to and reciprocity with downtown St. Louis. 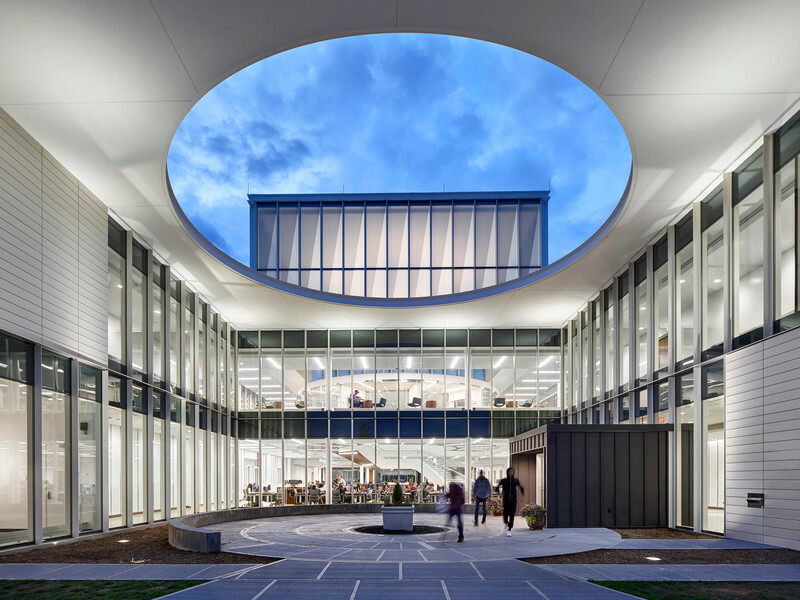 The Museum’s new sense of space and generosity that results from this responds to and references the revitalized landscape of the Arch grounds, as well as its significant new engagement with the city, river, and region.